Set in the heart of beautiful Ennerdale, England's remotest, quietest and least inhabited valley, Low Gillerthwaite rests at the feet of Pillar, Steeple and Red Pike. Access is by a forestry track which flanks Ennerdale Water leaving the nearest public road about 2 miles away. 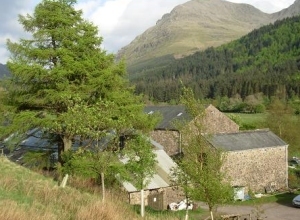 The centre is adapted from traditional Lakeland 17th century farm buildings and offers self-catering accommodation for up to 40 people. It is therefore an ideal base for walking, climbing, canoeing, orienteering, field studies and exploring Lakeland's remotest mountains, valleys and fells - and we're open all year, except Christmas. Our accommodation comprises: two cosy lounges (each with log fires), a well-equipped kitchen with catering size cooker, dining room which can seat 40 people, 5 dormitories, large drying room and large barn. Outside is a 2 acre field which can be used for games and camping. For full details see 'about - the premises'. Our resident Warden will help you settle in when you arrive. Download our Astronomical Calendar showing what to look out for at LGFC during 2018. School groups; university students; youth groups; walking and climbing clubs; can oeing groups; orienteering and running clubs; family groups; religious groups seeking a quite retreat; mountain rescue teams; Duke of Edinburgh award participants; star gazers. Low Gillerthwaite is a residential Field Centre which is available to be booked by any number from 1 to 40, who wish to come and enjoy the quiet and tranqility of the Ennerdale Valley in West Cumbria. School and Youth Groups may wish to include in their visit a programme of science activities with themes in Astronomy, Geology or Sustainable Energy offered under the Low Gillerthwaite STFC Education Hub. We are a charity and all income from overnight stays goes towards maintaining and running the Field Centre. If you are a regular visitor to Low Gillerthwaite you may wish to join our membership. Much of the maintenance of the property is carried out by the members and we have an annual working week (usually in August) where everyone is welcome to help out with decorating, repairs, wood collection, painting, catering, etc. This year we’re aiming to raise £990.00 for the Centre to buy a Defibtech Lifeline AED Defibrillator Unit. You can help us by raising free donations using a website called www.easyfundraising.org.uk. Did you know that whenever you buy anything online - from your weekly shop to your annual holiday - you could be collecting free donations for Low Gillerthwaite Field Centre? There are nearly 3,000 retailers including Amazon, John Lewis, Aviva, thetrainline and Sainsbury’s, who’ll give a free donation to Low Gillerthwaite Field Centre, it doesn’t cost you a penny extra. 1. Head to https://www.easyfundraising.org.uk/causes/lowgillerthwaitefieldcentre/ and join for free. There are no catches or hidden charges and Low Gillerthwaite Field Centre will be really grateful for your donations. If you shop on your mobile or tablet, get the free easyfundraising app and you’ll never miss a donation. To get it, visit the App Store or Google Play and search for ‘easyfundraising’ or find out more here: Get the Easyfundraising app. Thanks for your support! "a fabulous setting for a weekend away, isolated and no interruptions"
"good classroom facility and a field to play in"
"well equipped and very reasonably priced when cost is a factor"
"we love playing football in the field, and star gazing at night"
"a wonderful place to bring young people into an appreciation of the outdoors"
"the ability to book exclusive access is essential with CRB issues and the fact that you have access to the field, class room, orienteering and walking in the hills"
"We are located in Surrey but the long drive was more than compensated by the fact that we didn't have to get in our cars again until we left."